Kyushu K9W Momiji ("Maple") "Cypress"
Dimensions 24'1" by 21'9" by 8'8"
Power plant One 1100 hp Hitachi [Ha-47] 11 air-cooled 4-cylinder inline engine driving a two-bladed wooden propeller. The K5W1 used a Hitachi GK4A Hatsukaze 11 engine. 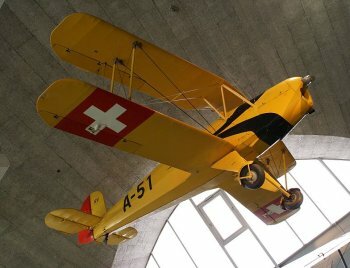 The Kyushu K9W biplane trainer was a version of the German Bü 131 Jungmann built under license and using Japanese aircraft engines. The Army produced a slightly modified version designed the Ki-86. Both versions were excellent trainer aircraft, the Ki-86 replacing the Ki-17 "Cedar" trainer.